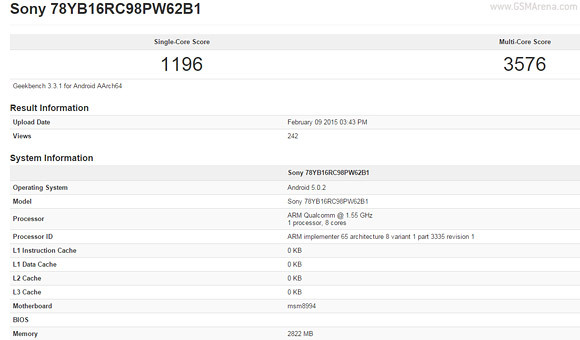 The Xperia Z4 leaks keep mounting, the latest coming from GeekBench. The benchmark confirms a Snapdragon 810 chipset and Android 5.0.2 Lollipop, which is what previous rumors have claimed. The benchmark only found 3GB of RAM though, not 4GB as earlier leaks have suggested. The Qualcomm MSM8994 chipset, aka Snapdragon 810, features four Cortex-A57 cores and four Cortex-A53 in a big.LITTLE configuration. The processor was only detected at 1.55GHz, which is the top speed of the A53 cores, the faster A57s go as high as 2GHz. On the graphics side the new Adreno 430, succeeding the 420 in the Snapdragon 805. The new GPU is supposed to offer 30% better performance over the old design, the Cortex-A57 is similarly set to bring 30% more oomph than the A15. Unfortunately, GeekBench is a CPU-centric benchmark and didn’t even list the screen resolution. It has been suggested that Sony will launch the Xperia Z4 with both a 1080p screen and a QHD one. There's nothing on the camera either, reportedly it will be a 21MP shooter, perhaps using the new IMX230 sensor. The Sony Xperia Z4 has gotten certifications from the FCC and its Indonesian and Japanese counterparts. We've also seen several of its components leak, all suggesting the handset is close to ready. However, with no press conference at the MWC, chances are Sony won't launch it there and will hold its own event instead.